It has nothing to do with the concept of synchronicity. It all about the power of observation, understanding the nature of numbers with regards to roulette, and engineering results. Roulette cannot be beaten by mathematicians; that's a fact. Engineers, on the other hand, create solutions. So, we need to be mathematical engineers, then? Math is absolute. Probability engineering tells a different story. ... answers a question with a single number, assumed to occur with certitude, while probabilistic methods provide a range of likely answers, plus a statement on the probability of a given result. ... makes predictions about uncertain future events based on less than ideal observations of the past. ... and thus leverages the engineer's understanding of how things work with the statistician's capacity to figure out whywhen they don't. There are 3 big moves in the game. The periods of gain the periods of losses the periods of stagnation. To increase the gains, it is necessary to act on the periods of losses that sometimes cost a lot of stakes, and on periods of stagnation that bring in nothing (in flat betting) and waste time (therefore units). It is important for each method to choose spins (favorable sequences). I just found on the first dozen a gap of 38/1 (out of 39 spins). You have to be rich to win this session with a progression that plays all the spins! Often, there is a fairly long equilibrium period between all dozens, then the imbalance comes, and the gap settles (on a dozen). Or a dozen comes too often, then it does not come anymore. Before the period 38/1, the three dozens were in near-perfect equilibrium on the 30 or 40 spins. An excessive period of equilibrium is also a phenomenon to be observed. So be careful because after a significant gap, a period of balance can come without making it easy to win. The advantageous wave does not always come quickly. Or a period of equilibrium is gaining a progression but when the gap will come it will resume all units if we don’t stop. Often it would be better for the player to stay at the bar, watch the tables , and bet when a period will stop or start. It's all tolk .. what really produce a profit is to know when to bet and when to walk. No back testing ( after the effect ) will produce this knowledge. Only proper data collection and play model can help player to know when to act and when to not bet. Exactly, MrPerfect ! The art of the game is to know when comes our advantage and when we have to disappear. You have to bet when the phenomenon comes and leave when it faints. It's also a camouflage technique to protect yourself from dealers and other curious players. I am a partisan of the long collection of data to build our knowledge, because we must first overcome our illusions before we want to win the game. 38/1 is an AWESOME opportunity because those other 2 Dozens literally cleaned up! So 38/1 is no threat to continuous betting because we simply change our selection with the flow of the waves. Equilibrium is also no threat to continuous betting with a progression because a perfect balance is all we are really asking for, while we pursue the results that exceed expectation; equilibrium is guaranteed profit. Maybe some players manage to avoid the gaps (with this idea to follow the flow). But there are so many players who think that their very mechanical progression is solid. They can try on this gap of 38/1! Third, you look confident in your progression. A statistical reality asserts that on equiprobable (or triple, etc.) chances, there is a figure opposed to all progressions. You will have to find the certainty that this figure (and its repetition) is not a problem for you. Oh its definitely a problem! I guess it can be called perfect imbalance, which is when the flow of the waves perfectly shift in a different direction than each of my bets. Roulette has a practically infinite capability of doing this (certainly greater than the amount of my bankrolls) and so eventually I arrive at a place where it is best to simply limit my losses. 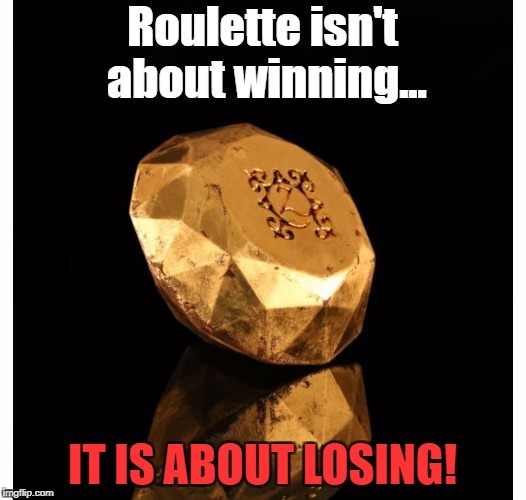 Limiting one's losses effectively is the Golden Key to a winning roulette system, period. A HG has no need for this. I feel the need to be crude and blunt: Any idiot can come up with a clever bet selection but it takes intelligence, dedication and technique to learn how to limit one's betting exposure over very many spins and only the skills of a professional can limit one's losses profitably. The skills of a professional is not tied to his ability to limit one's losses profitably. Rather his ability to maximize his winnings over his losses with a calculated bet selection based on optimum probability. "Limiting Losses" and "maximize winnings"; sounds like a pair of shoes to me. A method with a high hit rate is essential to profitable roulette play BUT a players ability to deal with losses effectively is just as important as a high hit rate method. These two go hand in hand. Ignore this and end up chasing losses with steep progressions because you are banking on the high hit rate and you will quickly see the demise of a healthy bankroll. There is no singular aspect to profitable play, in other words NO HG system. All factors are equally important in the approach and this equality of "aspects" can be best illustrated in STRATEGIC PLAY or more commonly referred to as Playing a Method. There is no way to have a high hit rate and bother with the losses. These 2 things are simply not compatible. You can play offencive or defencive , all other solutions is a road to nowhere. If one has a high hit rate, then one does not need to worry about losses, because a high hit rate will offset the losses and still turn a profit. The way roulette functions is that it will provide the high hit rate that we expect, the majority of the time. So we need to remove that from the picture. This is what I mean, "any idiot can create a clever bet selection". The rest of the time it will ignore our high hit rate, providing the slivers of a percent successive failures that are also to be expected. We need to focus on this because this is where we will lose all of our bankroll if we try to ignore it. So, now our high hit rate isn't working for us anymore, what do we do? We either limit our losses (winning system) or we outlast the expected negative variance (HG). A HG is simply stacking cumulative probability until it is so small that it is beyond the expected scope of a player's lifetime, or at least so rare that the amount lost is so ridiculously small and it is such an isolated event (once in a lifetime). I believe it is definitely possible to achieve this, despite the fact that some close their minds to it; the possibility doesn't cease to exist simply because they do not believe in it.